When I first started using crystals I was unaware of the need to cleanse them. This eventually led to me not getting the same healing power from them, giving up on the crystal way of life and abandoning them in drawer. It didn’t take me long though to work out I needed my crystals in my life, so I set about looking online as to why my beloved crystals were no longer serving me. I like to think of crystals as divine sponges… yeah you heard me – sponges! Why? Because they soak up the energy around them, be it positive or negative energy. So every time you use your crystals in say, a crystal grid, they soak up the positive charges from the other crystals in the grid, and they soak up your hopes, dreams and the energy you are harnessing. So, on the flip side, when you use crystals to help you heal, abolish negative thoughts and banish unwanted feelings, your crystals soak these up too. And that right there is why we need to cleanse. Sadly it’s not a case of the positive outweighing the negative and leaving the charges to fight it out internally like an episode of Game of Thrones. If you leave the negative charges in your crystals it will kill all the positive ones. Sad really, that when it comes down to it, the negative outweighs the positive, but that’s the way it is. So, on to how you cleanse! There are so many different ways, and believe me, it confused me too at the beginning. So I thought I would talk through some of the more well-known ways, discuss the pros and cons, and come up with my winning ways….. sound good? Ok – let’s go! This way of cleansing is probably the oldest way known, as both the sun and the moon are as old as some of your crystals. The ritual is very simple – you place your crystals in the rays of either the sun or the moon, and their energy will cleanse your crystals. It’s worth noting here that the energy from a full moon is much much greater, so it is strongly advised to wait until the full moon if this is your preferred way of cleansing. Pros – you do not need to purchase anything in order to cleanse your crystals this way – it’s free. The sun rises every day, and the moon comes out every night, so you can cleanse regularly. 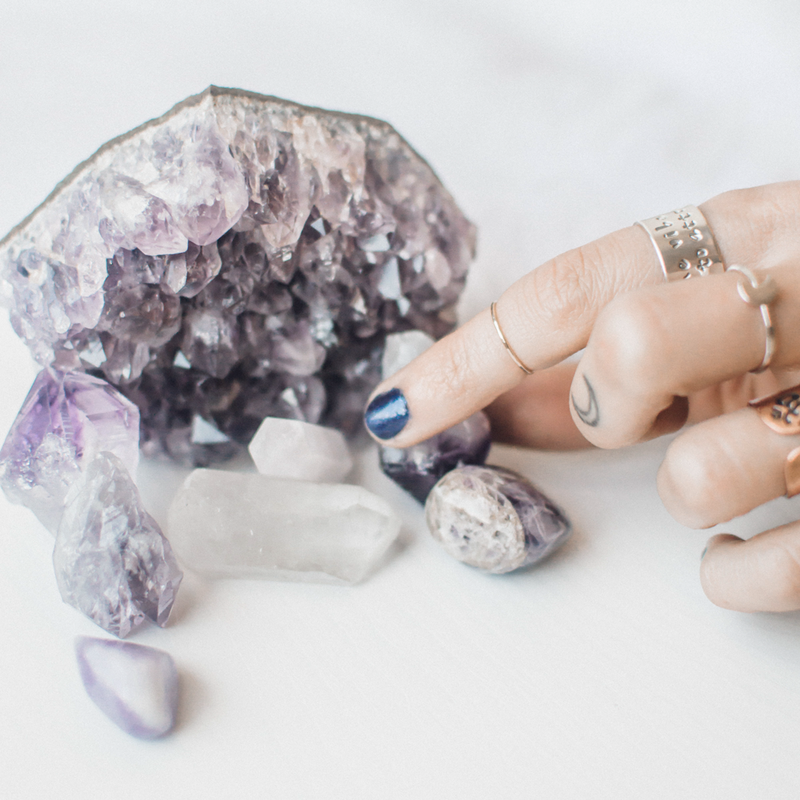 Cons – the sunlight can discolour your crystals, especially amethyst. People in cities may find it difficult to see the sun or moon from their home – people in flats especially. The sun/moon light energy isn’t always as strong as you need it to be especially in winter months. As I am sure you are aware, salt draws out moisture and dries things out. So salt is essentially another of nature’s sponges. 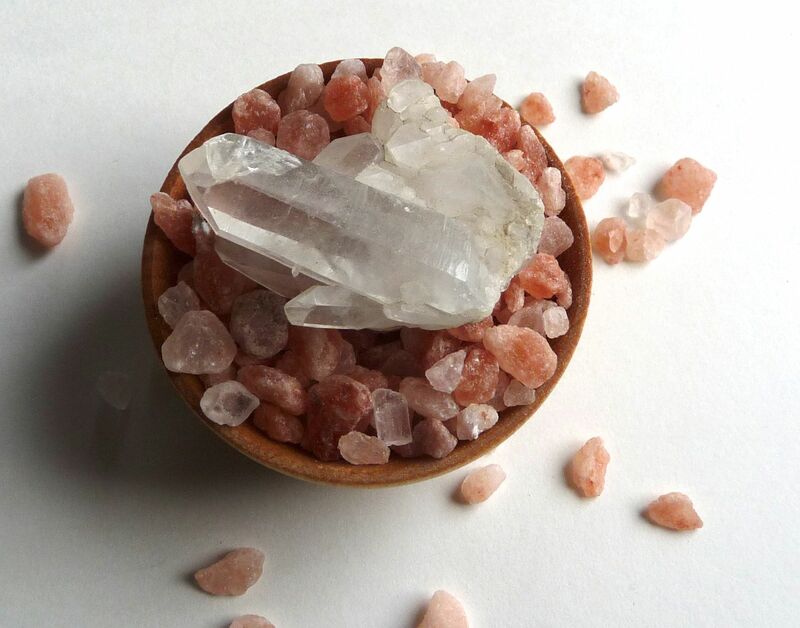 The ritual stipulates bathing crystals in a salt and water solution, or covering your crystals entirely in rock, Himalayan or sea salt. The salt with then draw out the negative vibes. It is vitally important that the salt used here is never ever used for anything else after and that your crystals are cleaned of any excess salt. Pros – the ritual is very simple and your crystals can be left for a few hours or overnight. This is classed as a very deep clean, getting into the heart of your crystals and clearing even the most negative of energies. Cons – there are some crystals that must not be salt cleansed due to their porous nature and water content (opals, pyrite, lapis lazuli and hematite are a few) so you will need to find another method for these. You have to discard of any salt used – and whilst some salt is not that expensive, the cost does mount up. Salt will draw moisture out of the area it’s in, so may affect the surrounding atmosphere (think plants and pets). If you are lucky enough to own a big geode cave or cluster (if you do, we may no longer speak as jealousy is a horrible thing) then you can use their intense power to cleanse your crystals. You simply place your crystals inside the geode, ensuring at least two thirds of your crystal is in contact with the geode. The massive power geodes hold will banish negative charges within your crystals within a matter of hours. Not only that, but geodes will also provide a charge, so you essentially get two for the price of one. Plus, they look beautiful. Pros – You can cleanse and charge your crystals overnight in one go – no additional action needed. It’s free (apart from the initial cost of your geode). You own the geode meaning you can cleanse whenever you need to. Cons – your geode may only hold one or two crystals at a time, depending on it’s size, so it may take a while to cleanse them all. Geodes are expensive, so unless you own one anyway, this is probably the most expensive way to cleanse. Not everyone has the space for a geode large enough for this method. Another old age practice - using the smoke from incense to clear away the negative charges. Simply light the incense and wave the smoke across your crystals (using your hand or a feather). The smoke will draw the negative charge from your crystals using certain elements found within and then banishes them into the air. 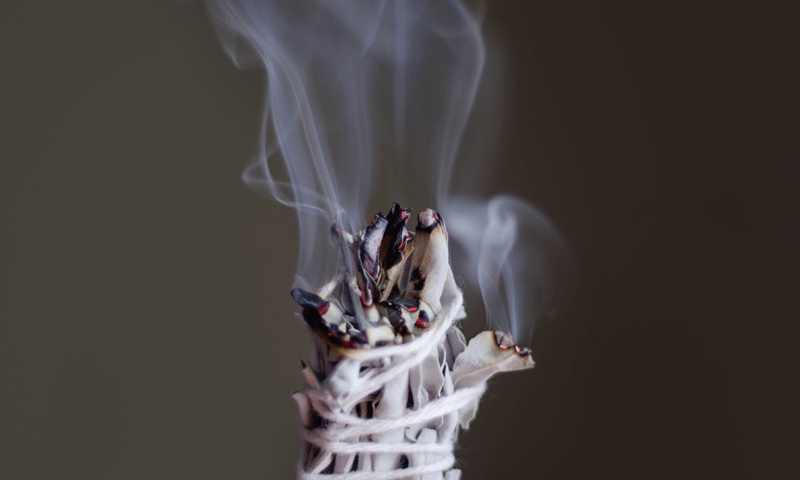 If you are using a smudge stick (like our ‘love within’ stick, sage bundle or our ‘palo santo’ bundle) you can use the fronds within the bundles to wave the smoke – really simple). Pros – this is a really simple process, cleansing your crystals in a short amount of time. You can purchase some really beautiful scents, leaving your home smelling beautiful. You can cleanse a large amount of crystals at the same time. Cons – not suitable for anyone with respiratory problems such as asthma. Not everyone likes the smell of incense. There is a cost involved. Not suitable around babies. Visualisation or ‘thought-energy’ can be used very effectively to cleanse your crystals. Simply sit somewhere calm and quiet, and hold your crystals (one-by-one) and focus all your energy on what you are holding. First, visualise a bright, white light surrounding the crystal (like an aura). When the light is as bright as possible imagine it penetrating the crystal through the middle, like a spear – fast and precise. This light spear will attach to the negativity inside the crystal and piece it through to the outside. Imagine this spear going through the crystal as many times as required until you are completely happy that the negativity has been banished. Pros – a free and simple process that can be done at your leisure. Create a real connection with your crystals. The time spent cleansing is good for your soul. Cons – if you aren’t in the right frame of mind, this won’t work. The strength of the cleanse is only as strong as your belief. Not everyone has the time to do this. Ok – so what were your thoughts? Any of these really jumping out for you? For me, personally, there are two techniques I find more powerful and rewarding than the others. Self-cleansing. For me this is the one that really resonates. You are sitting with your crystals and holding them close. You are looking after them lovingly, and connecting to them in a way no other technique will allow. They learn all about you, and you learn all about them. They become a part of you. Not only that, I find the ritual peaceful and after I feel like I have meditated, and always feel more positive and enlightened after. I cherish this ‘me’ time, and I think the other half appreciate the hour to himself once a week too! Smudging. Again, this one, for me, works! I love watching the smoke billow from my smudge bundle and can really visualise the negative energy being pulled from my crystals and disappearing into the air. I also love the different scents you can buy, and I am in awe with the bundles we sell. And of course, the incense smoke will cleanse the air and atmosphere around your home – so you can completely clear all things negative from your home all in one go – perfect! Check out our Crystal Cleansing Pack here! So – how do you cleanse? Any new techniques here you will be trying?